Home › Articles › Strategy – Why is it essential to your organisation? The sustainability of children’s hospices has never been as critical and indispensable as it is today. For this reason, good corporate governance, strategic leadership and management are more crucial than ever. The time has come for organisations to move away from strategic planning and focus more on strategic management. 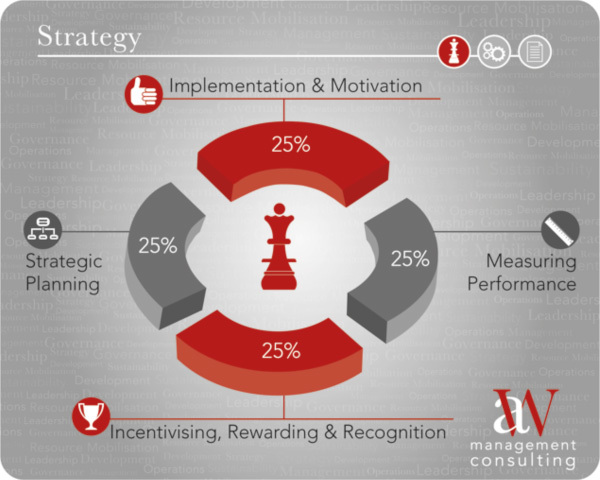 Strategic management is a complete and combined process of strategic planning (25%), business/implementation planning (25%), performance measurement and management (25%) and rewards and recognition (25%). This series of articles explore each of these elements and their importance to organisations focused on children’s social and development programmes. A strategic plan is a disciplined effort to produce fundamental decisions and actions that shapes and guides what an organisation is, what it does and why it’s doing it. Strategic plans are comprehensive documents that cover all aspects of an organisation’s work, including programmes and services, management and operations, fundraising and financial management, facilities and governance. What difference does a well-developed strategic plan make to an organisation? A well-developed strategic plan gives beneficiaries and the general public a clear idea of what the leadership and governance of the organisation plans to do to strategically grow and sustain itself for the future. All strategies in such a plan must be aimed at achieving the organisation’s mission and vision. One example is at children’s hospices, where children’s programmes must be holistic. How do I go about developing a strategic plan for my organisation? What is the purpose of developing this strategic plan for your organisation? What is the role, function and membership of the coordinating committee/person? What is the role, function and membership of the strategic planning team? What are the resources needed for developing the strategic plan? What are the organisation’s limitations? What are the organisational requirements, restrictions, expectations and pressures of the organisation? What legislation, policies and/or contracts will influence the strategic plan? What are the fundamental policy questions and critical challenges affecting the organisation’s mission and vision? It is critical to deal with challenges and issues in order to ensure the organisation’s survival. Failure to do so can have undesirable results. Following these steps will ensure that your strategic plan is inclusive and informed of the realities of your organisational culture. A first step is to locate your strategic plan, read through it and check that it is up-to-date and relevant. If not, A|W Management Consulting can assist you to develop a new strategic plan. This is the first in a series of four articles exploring the importance of strategic planning, business plan development and implementation, performance management and measurement and rewards and recognition. A|W Management Consulting’s key aim is to support and advise organisations on how to become sustainable with good corporate governance and effective human resource management. We can be reached at info@awconsulting.co.za and www.awconsulting.co.za. Like our Facebook page.